Singapore Night Safari is a world-class attraction that not only provide entertainment and wonder for visitors, but are dedicated to conservation, rescue and research to help improve the lives of animals both in captivity and in the wild. Thousands of animals from Asia, Africa, Europe and the Americas can be seen in the spacious natural environments of Night Safari. 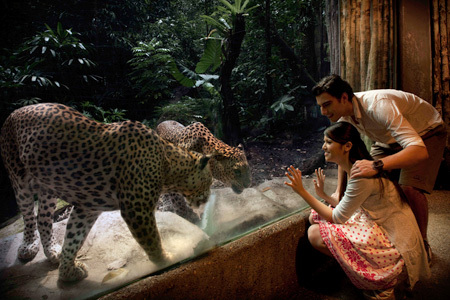 These attraction alone help Singapore earn its well-deserved reputation as one of the most family-friendly destinations in Asia. Singapore's nightlife is truly wild! The Singapore Night Safari offers an unusual glimpse into the nocturnal animal kingdom, with more than 59 exhibits and 1,000 animals to be seen. Take a trip around the world via walking trails and trams that connect eight geographical regions. See exotic and often endangered species such as the Himalayan griffon vulture, greater one-horned rhinoceros, wildebeests, gazelles, giant anteater and the gaur (wild cattle) of Burma. Start with the Creatures of the Night Show for a good 20-minute overview of the animals to be seen here (show times 19:30, 20:30, 21:30 and, on weekends and holidays, 22:30), then move on to the Himalayan Foothills via tram to see bharal, Himalayan tahr, mouflon and markhor traversing the rugged terrain.